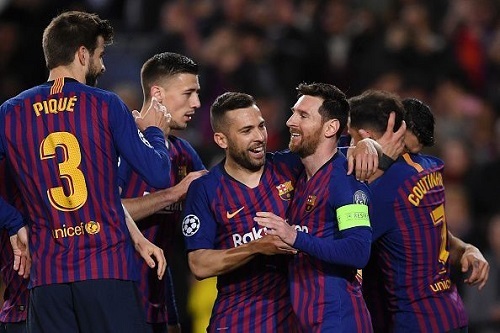 FC Barcelona defeated Lyon 5-1 at the Camp Nou to clinch a spot in the UEFA Champions League Quarter-Finals for the 12th consecutive season. Over 92,000 Blaugrana faithful were in attendance to witness Messi perform his wizardry in tonight’s victory. Barça struck first when they were awarded a debatable penalty following Jason Denayer’s foul on Luis Suárez and Messi scored with a Panenka penalty in the 17th minute to open the scoring. The Blaugrana would grab a second in the 31st minute following some good passing from Arthur and Luis Suárez which allowed the Uruguayan to square the ball to the unmarked Coutinho to tap it in without difficulty. Lyon managed to pull one back after Tousart scored in the 58th minute to give Lyon a fighting chance of advancing to the next round if they were to score another away goal. However, Messi dashed those dreams after he received the ball from Rakitic, before turning Marcelo and Denayer and unleashing a shot that got by substitute goalkeeper Mathieu Gorgelin. Messi then went from goal scorer to goal provider when he produced an excellent assist for Piqué to score during a counter attack in the 80th minute and give minutes later, he set up substitute Dembélé to make it 5-1. This result meant Barça were back in the Quarter-Finals again, and as the lone Spanish side after both Real Madrid and Atletico Madrid were eliminated. They are joined by Ajax Amsterdam, Porto, Juventus and the four English clubs, Manchester City, Manchester United, Liverpool and their group stage opponents, Tottenham. Even though it was a night worth celebrating, there was some bad news as Dembélé picked up a hamstring injury which could see him miss the Quarter-Finals. Barça now have to shift their attention to this Sunday’s trip to Andalusia for their return encounter against Real Betis, who were victorious in their visit to the Camp Nou earlier in the season. FC Barcelona: Ter Stegen, Sergi Roberto (Semedo, 82′), Piqué, Lenglet, Jordi Alba, Busquets, Rakitic, Arthur (Arturo Vidal, 73′), Messi, Coutinho (Dembélé, 69′) & Luis Suárez. Olympique de Lyon: Lopes (Gorgelin, 33′), Doubais, Denayer, Marcelo, Mendy (Cornet, 77′), Tousart, Ndombele, Marçal, Fekir, Depay (Traoré, 72′), & Dembélé. Goals: 1-0, Messi (17′ – penalty); 2-0, Coutinho (31′); 2-1, Tousart (58′); 3-1, Messi (77′); 4-1, Piqué (80′); 5-0, Dembélé (85′). Cautions: Lenglet (48′); Marçal (32′), Dembélé (45′). Previous PostBarça battle for a hard-fought 3-1 win over Rayo Vallecano. Next PostBarça defeat Real Betis 4-1 for a 10-point cushion.